Despite having played soccer for 10 years, I’ve never got into watching the pros, except for the World Cup. Like the Olympics, once it arrives I watch whatever is on basic TV and hope for good sporting. Colombia, for my time there in 2010. Iceland, for my Scandinavian side. Sweden, for my part-Swedish wife’s sake, and because Finland isn’t an option. It’s hard to pick a favorite Jordy play, but one fond memory of mine is of his toe-tapping, game-tying TD on 4th and goal against Atlanta in 2010. I was living in Colombia and had to find a *cough* unsanctioned TV feed online to watch Packers games. I projected the game onto a wall in my host family’s house and tried to explain the rules of American football to my Colombian friends. (Nothing brings home how strange American football is when you have to explain it to foreigners.) My explanations got increasingly animated as I paced the floor for the thrilling finish. Godspeed, Jordy. Here’s hoping the Packers won’t have to play against you. I am here to face you, Larry, so you can I see I have regained my strength, that I am no longer a victim. I am a survivor. I am no longer that little girl you met in Australia, where you first began grooming and manipulating. As for your letter yesterday, you are pathetic to think that anyone would have sympathy for you. You think this is hard for you? Imagine how all of us feel. She goes on to recount precisely how Nassar abused her and so many other young athletes, and how the system of complicity around him enabled it to go on for so long. I shouldn’t be surprised Raisman was so poised and confident; she’s a three-time Olympic gold medalist in a sport that seems to me to be one of the mentally toughest. But she was far from the mat here, and I applaud her and the many other young women who have come forward to share their stories. This is a guest post by my friend and fantasy football foe Brian Waters. Note: Nothing mentioned in this article is meant to be a recommendation for your investment portfolio. The rapid increase in popularity of daily fantasy football leagues like DraftKings and FanDuel has triggered a debate over whether these games constitute gambling. One of the biggest arguments I hear in this debate is that playing daily fantasy leagues is as much like gambling as investing in the stock market. As a Certified Financial Planner™ who plays fantasy football, I’ve always been irked by that claim. Though there are similarities between fantasy football and the stock market, which I’ll get to below, there are some blatant differences between the two that should be clarified. The first and biggest difference between daily fantasy football leagues and the stock market is the idea of “winning.” The objective in daily fantasy is very simple: score more points than your opponent to win money. If you score fewer points, you lose the money you put forth to play. This zero-sum aspect to daily fantasy makes it much closer to blackjack than investing. In the stock market, each investor has a different risk tolerance, timeline, objective, and experience to factor into each investment decision. These different factors impact performance; therefore, each investor generally has a different idea of what it means to “win” in the stock market. A retiree taking regular withdrawals from their account will likely be invested much more conservatively than a 25 year old who has 40 years before withdrawals will begin. In this example, the retiree and the young worker likely view “winning” differently because they likely have different objectives (income vs. growth) and timelines (short vs. long). As you can see, each gained in 2014; however, Company B was outpaced by C and A. If you held B shares, it would be hard to say you “lost” in 2014 because you still had a 25% gain. “Winning” in the stock market, then, can mean different things for different people. Though, in my mind, the differences between investing and fantasy football outweigh the similarities, let’s look at what they have in common. Shifting from daily/weekly fantasy leagues to the season-long leagues, in both investing and fantasy football it is important to do your research. Before the draft and during the season, a manager has to consider a lot of questions that will affect his team’s probability of success: How does this player perform against this team? How injury-prone is my running back? Does my defense play well against a passing offense? Which of my receivers have the most favorable matchup this week? Similarly, investors may ask: How does this stock perform in rising interest environments? Will the seasonably warm weather affect sales? Will slower GDP growth in China affect future overseas earnings? And so on. The ability to accurately predict the answers to these questions will likely help a fantasy football team or an investment portfolio find success. To maintain a successful fantasy team throughout the season, you want a roster filled with dependable players who perform consistently week to week, along with certain “high flier” players that put up high point totals. Consistent players like Tom Brady, Antonio Brown, Adrian Peterson, and Matt Forte can dependably put up a predictable amount of points and make up your roster’s foundation each week. Supplementing this foundation with high fliers like Odell Beckham Jr, Dez Bryant, Ronnie Hillman, and Danny Woodhead—less predictable playmakers who could put up a huge game one week and get shut down the next—will give you the best chance to defeat your opponent each week. Likewise with investing: depending on your risk tolerance and timeline, portfolios generally balance growth and value stocks, as well as bonds and other investment types. Certain stocks carry a lot of risk that can propel a portfolio in good years and drag it in bad years. Because of that risk, investors generally carry different weights of these investment types to help them reach their financial goals. Fantasy football rosters undergo lots of change throughout the season. Good managers maintain healthy rosters through bye weeks, suspensions, injuries, and other unexpected factors. If an injured player is expected to return in a few weeks, managers have to decide if that player is worth holding onto on the bench or if they should be let go for a player who can play right away. When reviewing trades, managers should try to swap overvalued players for those who will likely perform better in the future. And when considering players available on the waiver wire, they should beware overreacting to player having a breakout game and potentially dropping a player whose best performances are ahead of him. Principles of investing follow many of these same rules. Many investors ask themselves if a security is worth holding through a bad earnings report or corporate leadership change. They also must decide if swapping one stock for another is an overreaction to a current slide in the price. Ultimately, the general goal is to buy low and sell high with investments, just as it is in making trades and waiver wire pickups in fantasy football. Comparing investments to fantasy football is like comparing apples and oranges. Just because you may be good at fantasy football does not mean you will be successful at investing. This was an exercise of combining two aspects of my life that I find interesting and relevant. Vic, I have learned to not live or die win or lose over the years, but I can’t help but feel some apprehension heading into the game Thursday. I realize as a fan the best I can do is root my heart out, but can you add anything to allay my apprehension? You want a guarantee? Sorry, there are no guarantees, and that’s what makes the game so much fun. You have to decide what it’ll take for you to enjoy the game and not allow your emotions to overcome you. That’s your personal challenge. All I can tell you is that victory and defeat are out of your control. You have no say in the matter, nor are you in any way accountable for the outcome of that game. You are merely a viewer. I think it helps fans to remind themselves of that fact. I think fans have somehow deluded themselves into believing they have a role in these games, and I think they have to guard against thinking that way because it can trigger emotions that rob them of their ability to enjoy the experience. I acknowledge fans attending the game can impact the game with their energy, but if you’re planning on watching the game on TV on Thursday, all you can do is watch. That’s what I’ll do on Thursday and I am really looking forward to it. Nothing will rob me of my joy for what I’m going to see on Thursday. I hope you can say the same. Personally, achieving this perspective has been incredibly liberating. Once I realized that I had 0.0% control over the outcome of the game, I could let go of the anxiety that cripples many sports fans, especially those as dedicated and vociferous as Cheeseheads. I get excited with victories and sad with defeats, but I try not to let those emotions dictate my behavior or linger beyond game day. It really is just a game, and we really are mere viewers. Why accede my well-being to something I have no control over, and matters very little in the grand view of life? Football matters—especially stockholding Packers fans like me—but it should also be fun. 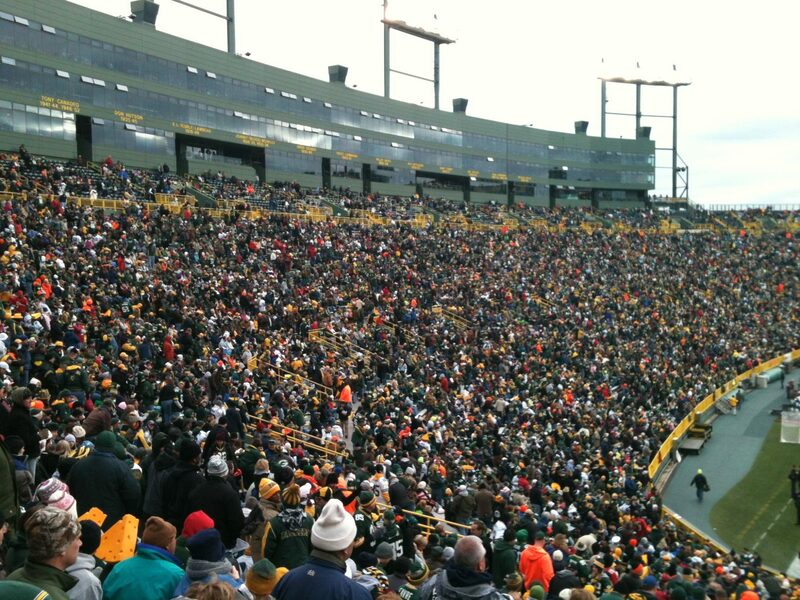 Photo: The Packers faithful at a game I attended at Lambeau Field in 2011. There’s new quarterback drama in Green Bay this season that will likely quicken the blood flow through the cheese-clogged arteries of Packers fans like me. We are lucky that it does not involve the health status of Aaron Rodgers, who looks yet again ready to conquer the league. Rather, it involves whether Brett Favre will be booed when he returns to Lambeau Field for the first time as a retired player. The man himself acknowledges this (or at least hopes for it), saying he’s not worried about being booed for leaving and playing for the Vikings because “I’m well aware that you can’t please everyone. Not everyone’s going to like you regardless, and you know what, so be it. But I think the 16 years that I had in Green Bay speaks for itself.” Of course, Favre was booed when he returned to Lambeau as a Viking in 2009, and under the circumstances understandably so. But those hard feelings have softened considerably since then. Why? Because absence makes Packers fans’ hearts grow Favrer. Since the Man of Mississippi left in 2008, the team has enjoyed a Super Bowl victory, an all-star quarterback with a strong backing crew, and a long string of successful seasons; how can Packers fans not be happy? And now that Favre has been away from the game for three full seasons after a checkered post-Packers denouement, reuniting feels all the more desirable. It’s also inevitable, given the unanimous consent for Favre’s entrance into the Hall of Fame in 2016. I think all parties involved in 2008’s acrimonious split–Favre, the Packers organization, and especially the fans—long for restoration. 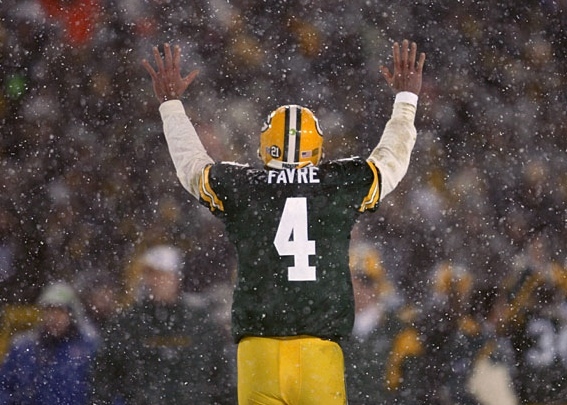 When I think of Favre I want to think about the 2008 divisional playoff game against the Seahawks, the audible to Andre Rison in Super Bowl XXXI, the Oakland game, and the prankster. Sure, he also brings with him the interceptions, the occasional scuzziness, and 4th-and-26. But when the prodigal son returns home, you don’t demand a confession or rehash grievances. You celebrate. You remember that football is just a game, and that players are people too. And you, if you’re like me, eagerly anticipate Bart Starr, Brett Favre, and Aaron Rodgers standing together for the first time for a long-overdue photo-op. Packers Nation, let’s hope this happens soon. And I thought Wisconsin’s long, state-wide nightmare was over. A new documentary called Last Day At Lambeau, which chronicles the Brett Favre “retirement” saga of 2008, is set to be released in Madison next week and is sure to re-trigger some dormant emotions among Packers fans about the Ol’ Gunslinger himself. I haven’t see the film yet, but as I watched the above clip on the film’s website my first reaction was to laugh. Seeing footage of Cheeseheads rallying behind the bearded Mississippian, crying “Bring Brett Back!” as they picketed Lambeau Field, made me realize how silly that whole melodrama was at the time and how foolish it is in retrospect. Let me say this: never at any point in my life do I want a professional sports organization – let alone the Packers, a team I adore and own fake stock in – to consult me about business decisions. I have enough self-awareness to know that I know nothing about how to run a successful football team, so to think that these Packers fans expected to be consulted by the team before making a decision about what to do with Favre is preposterous to me. Listen, I get it. I loved Favre too. There’s proof of that on the Internet. I still stand by those words because they represented how I felt at the time. But you know that Super Bowl the Packers won in 2010, and the 15-1 team and league MVP they had in 2011? If the rabid Cheeseheads of ’08 got their way, say goodbye to all that. Ted Thompson, Mike McCarthy, and Mike Murphy were smart enough then, in the midst of a tumultuous offseason, to make a very tough but very smart decision. I don’t buy the argument that Thompson & Co. should have let Favre come back after retiring just because of what Favre had done for the organization. Indeed, he did a great many things that I got to witness first-hand, but he retired. He made that decision, not Ted Thompson. The organization decided to move on and invest in its future with Aaron Rodgers, which I’m sure many of the fans who picketed Lambeau and booed Rodgers at training camp are pretty OK with now. As I haven’t seen the full film yet, I won’t make any grand judgments about it. As a lover of all things Packers, I’m excited to see an in-depth look at the organization’s defining moment. But if it’s ninety minutes of pointless pontificating and Packers fans bellyaching in news clips about trading away The Legend, then count me out. Enough ranting about Brett. Time to watch some Aaron Rodgers highlights. I can’t sit still when it’s down to the wire. Four minutes to go in the fourth, the Packers are driving for the game-tying score and I’m on my feet, pacing around my room. It’s been a wild shootout at the NFC Wild Card game: Green Bay’s young gun Aaron Rodgers and Arizona’s grizzled gunslinger Kurt Warner were taking turns tearing up the turf with laser-precision touchdown throws, the defense on both teams nonexistent. In the third quarter, the Packers were down by 21 and gasping for air; now, they’re knocking on the door. This is the second time in three years the Packers have been in the playoffs. In 2007, we—in Green Bay, Packers fans own the team—had quite the playoff run. We demolished the Seahawks at Lambeau Field in the divisional round on a snow-covered turf. The next week, with the field temperature at or around arctic, the Giants come to Lambeau for the NFC Championship game. In the fourth we tie it up 20-20. The Giants have a chance to win with a field goal, but Tynes sends it wide left. Overtime. I’m on my feet, pacing nervously around the room. Favre throws an interception, and the Giants win it with a field goal. It’s all over. Today, the Packers are sweating in the Arizona dome. Rodgers connects with Havner, tying the game 45-45. Less than two minutes left, the Cardinals drive and set up for a field goal. Wide left. Overtime. I’m on my feet, pacing nervously around my room. Not again, I think. We win the coin toss. The lob to Jennings downfield – the game winner – is overthrown. Then Rodgers is hit, fumbles, a Cardinal picks it up and runs it in for the score. The game. It’s all over. The heartbreak hangover. Every sports fan has gone through it: the empty feeling after a devastating loss. The aimlessness. The Packers were on such a roll coming into the playoffs—the loss doesn’t seem real. Its suddenness makes it harder to accept. We were playing, then suddenly the ball came loose, it was in the end zone, and we were done. A bad dream, really. In the days after I joked with friends that I was going through the stages of grief. The denial came quickly: No, it’ll be called back. There was a penalty. Once it settled in, the anger showed up: What the hell? Why didn’t someone pick up that block? Then the bargaining took place: If we could just do the last play over again… The depression stuck for longer. Seeing the highlights from the game on TV the next few days made it worse. It wasn’t until about four days later when I was finally able to accept the loss and look forward to next year. This is all very melodramatic, is it not? Applying such a serious paradigm to what is ultimately just a game seems belittling to those suffering the loss of something more than a game. But it is a process many sports fan goes through—consciously or not—with teams and games they invest so much of themselves into; surely these emotions cannot be entirely frivolous. Often fanatics of any sport are looked down upon as obsessed, depressed loners in search of diversion and self-identity. But one theory the New York Times floats suggests fan psychology has its roots in “a primitive time when human beings lived in small tribes, and warriors fighting to protect tribes were true genetic representatives of their people.” Every team in its own way is a culture of people who share similar beliefs and customs. In sports those customs – unique chants, specialized uniforms, shared investment in the team’s history – allow spectators to form bonds with their “warriors.” Dr. James Dabbs, a psychologist at George State University, said in an interview that “fans empathize with the competitors to such a degree that they mentally project themselves into the game and experience the same hormonal surges athletes do,” especially in important contests, like a playoff game. “We really are tribal creatures,” he said. We wear jerseys and decorate our homes with the colors and faces of our favorite athletes – our warriors – and follow them into the field of battle, though our battle happens in the living room or in the stadium seats and instead of using our bodies to fight like the athletes do we use our voices and emotional support. So when our favorite team loses an important game, the effect is not just mental and emotional; it is common to feel physically depressed or even ill. Which brings us back to the Wild Card weekend. I watch my team – my tribe – fall as the others smile victoriously on the field of battle. I don’t feel ill, but I’m not happy. I commiserate with my fellow Cheeseheads online. I call my dad to make sense of the game. “I know,” he says. We were so close. We rehash everything that went wrong, but then turn to everything we did right. Everything that gives us hope for next year. And there is a lot of hope for next year. I think my tribe will be just fine.